Frank Strong talks with Heidi Alexander about content marketing and why it’s so important for lawyers. 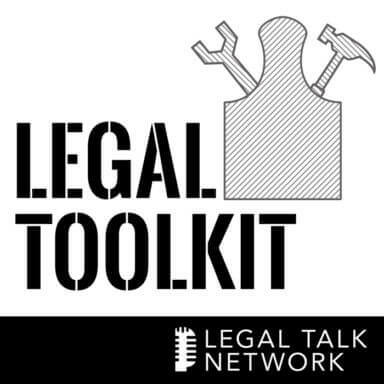 In this episode of The Legal Toolkit, founder and president of Sword and the Script Media, LLC. Frank Strong talks with Heidi Alexander about content marketing and why it’s so important for lawyers. Frank starts by defining content marketing, a business process for creating and distributing relevant and valuable content, and briefly explains how this process can help lawyers build trust with their existing and prospective client base. He lists a few content marketing characteristics, like working consistently and ensuring that you own your distribution channel, and emphasizes that your content creation efforts should focus mainly on whichever platform you own. Frank encourages attorneys to seek client-oriented questions to help them in the content creation process and to use their own anecdotal style to guarantee a unique brand. He warns lawyers to establish a consistent publishing schedule, manageable with their busy lives, and reiterates that sustainability is the goal. Frank also instructs legal professionals to view their social media outlets as satellites that operate around, and integrate into, their main content hub. He lists his content marketing best practices, like clear documentation and iterative improvement focused progress, and provides a few examples of what makes a good marketing strategy. Frank closes the interview with a reflection on how content marketing has changed over the years and some emerging trends he sees for the future. Frank Strong is the founder and president of Sword and the Script Media, LLC, a veteran-owned business based in Atlanta focused on PR, content marketing and social media services. However, most folks in the legal community will recognize him from his previous assignment as the communications director for the LexisNexis software division in Raleigh. During his tenure at LexisNexis he was the primary champion behind the LexisNexis Business of Law Blog, which garnered tens of thousands of visitors from the legal community every month and earned praise from likes of Forbes. Intro: Welcome to ‘The Legal Toolkit’ bringing you the latest legal trends and business initiatives to help you manage your law firm. Here are your hosts, experienced lawyers, writers, and entrepreneurs, Heidi Alexander and Jared Correia. You’re listening to Legal Talk Network. Heidi Alexander: Hello and welcome to a new episode of ‘The Legal Toolkit’, here on Legal Talk Network. I’m your host Heidi Alexander. I’m also a law practice advisor with the Massachusetts Law Office Management Assistance Program, that’s LOMAP for short. We provide free and confidential law practice management consulting services to Massachusetts attorneys. For more information you can visit our website at HYPERLINK “http://www.masslomap.org” masslomap.org. So here on ‘The Legal Toolkit’ my co-host Jared Correia and I provide you with a new tool each month to add to your own legal toolkit so that your practices will become more-and-more like best practices. And before we get started, we’d like to thank our sponsors. This podcast is brought to you by Amicus Attorney, developers of legal practice management software. Let Amicus help you run your practice so that you can focus on what you do best practice law, visit HYPERLINK “http://www.amicusattorney.com” amicusattorney.com and get started today. We also want to thank our sponsor, Scorpion, who delivers award-winning law firm web design and online marketing programs to get you more cases. Scorpion has helped thousands of law firms just like yours, attract new cases and grow their practice. For more information visit HYPERLINK “http://www.amicusattorney.com” scorpionlegal com/podcast. Back in 2012 when the term ‘Content Marketing’ was beginning to gain traction in the legal market we discussed it here on the podcast. Now, four years later, it’s about time we circle back to that topic and take a look at the current state of content marketing. My guest Frank Strong is the founder of Sword and the Script Media, a veteran-owned business in Atlanta that provides PR, content marketing, and social media services. I’ve known Frank as many folks in legal community since his days as the Communication Director for LexisNexis software division in Raleigh. During his tenure at LexisNexis he was the primary champion behind the LexisNexis Business of Law Blog which garnered tens of thousands of visitors from the legal community every month and earned praise from the likes of Forbes. Before Lexis he worked with a number of PR and communications companies. So suffice it to say Frank is a strong background in PR as well as intimate understanding of the legal market. Thanks for joining me today, Frank. Frank Strong: Hey Heidi, thanks for having me, I’m glad to be here. Heidi Alexander: Since we are talking about content marketing in this show, we’d better first to find the concept. So tell us what it is and why it’s important for attorneys? Frank Strong: Yeah, that’s a good question because there’s an awful lot of noise over the term and as a result there is a confusion between what is content marketing and what is just marketing content? So let’s start with a definition and I am going to use the ones from the Content Marketing Institute and it says, “Content marketing is a marketing and business process for creating and distributing relevant and valuable content to attract, acquire, and engage a clearly defined and understood target audience with the objective of driving profitable customer action. Now that’s a mouthful. So let’s unpack it a bit. Let me give you a simple example. It may be oversimplified but for the sake of illustration a plumber decides to make a video on how to fix a sink and an objection might be, well, I don’t want to show people what I’m doing because then it might jeopardize my business, metabolize my business, but in fact what will really happen is people will watch that, they will understand the process the plumber goes through and then probably hire him or her anyway to get the job done because it’s about education, and education is a path to building trust, and trust is obviously pretty important aspect to a business like a law firm where clients invest in good legal counsel and place very sensitive issues in the hands of their attorney. So there is a couple of characteristics and I’ll finish up with these characteristics, these is, number one, it’s a platform that you own, but it’s a microsite, a resource page, a blog or it’s some other medium that allows you to directly attract and engage a community of clients, potential clients. Number two, it’s consistent and that’s important not only to condition you to produce but also to condition the audience to expect when to see that content. Number three, has some form of utility, educational value. Number four, it’s built for the long-term, as compounding returns, just like an IRA or a 401(k), you’ve got to invest both in the up streams and down streams of a market and the returns compound at the time, and then finally I’d say, it’s not just a program but it’s a culture. It’s about your entire practice and how you market and address the needs of your clients and perspective clients. Heidi Alexander: Now you just touched upon this, but let’s really dig in here. What do you recommend for attorneys in terms of where they should publish their content? Is it better to focus on building up let’s say one content distribution channel such as a blog or should you aim to produce content for distribution in multiple places? Frank Strong: Another great question, it comes up an awful lot, and if there is one thing that folks listening remember from this podcast and takeaway is this: Don’t make home improvements to rental property. What this means is, focus your efforts on a platform that you own, be that a website, a microsite, a research page, or blog because if you don’t own the platform, the rules can change. A very clear example of this is Facebook. A few years ago there were businesses that were questioning whether they even needed a website anymore because their Facebook page is so effective. Then the platform started to monetize and what they did was they cut again to reach to mere zero. In other words branded pages like there is a law firm that might have are nearly zero visibility unless they pay money. So it doesn’t matter what the platform is, whether it’s LinkedIn, Google+, YouTube, Snapchat or media, if you don’t own it, they can pull the rug out from underneath you. So, does that mean that you should never publish on it again or never write contributive articles or never do any sort of video advertising? Of course not. But do those things in an integrated fashion where A. you are not over-reliant if the rules change, and B. you have a standing invitation or a call to action for a little bit of that community to join yours. Heidi Alexander: Now when I talk to lawyers about marketing their practices, I inevitably get two questions when it comes to content. The first question is, how do I come up with all of this stuff? And the second question is, how do I make it unique, I mean, hasn’t someone already written about this topic? What do you recommend here? Frank Strong: So the easiest place to get started is by answering customer questions. Now, I’m a small business, say, I recently gone through a contract phase where injunctive relief came up. Well, I don’t know what injunctive relief means. I am a businessman, I am not a lawyer. What’s the first thing I did, I Googled for it, so I can understand. The same could be true in other aspects. If you are in family law, what is the process to Petition for Legitimization? People won’t understand how long it takes, where they have to go, what are the steps that are involved. And so, where can you find these questions that clients might have? Start by listening to them and write them down, every time you hear a client or a perspective client ask a question, write them down. Certainly you can do a whiteboard, a brainstorm with staff whether that’s paralegals, other attorneys, even the folks that answer the phones, they are entering questions as well. And of course, going through a number of electronic forms or online forms, if that’s a review site like Avvo, Quora, which is a Q&A platform, LinkedIn Groups, even news and articles or blog-posts might come up with questions. The second part of your question is, how do we make it unique? Well, use stories and anecdotes. Our minds are wired to a number of stories. So tell in your own way. The reason why that’s important is because it’s just like learning in Osborn High School. You might have tried to learn from one teacher and that teacher did amazingly good to show you how to do it, you just didn’t get it. But then suddenly you went to a different teacher, he showed you a slightly different way and the light bulb goes off. It’s the same thing here. So why is all of this important? That’s because most of the digital traffic, for example, traffic that a website might get, comes from searching it and searching is an explicit expression. Second, there is no such thing as agnostic search. So no two search results are ever going to be the same. If you’re telling stories and you are saying things in your own way, your content is going to be unique. Heidi Alexander: Thanks, those are all great ideas. Now, as you know, from working in the industry, attorneys, they are busy. It’s tough to find time to draft and then also to publish all of this content. So what do you suggest as a realistic publishing schedule? Do attorneys need to carve out time each day, or each week, or even each month? Frank Strong: So the answer to that one is probably some worry to lawyers, it depends and I caveat that, so with the caveat that quality is probably the minimum barrier to entry, consistency matters more than frequency. Like I said before, it conditions both you and your community whether that’s once a month, twice a week or everyday whatever you do, you do it consistently. And as an extension of that you have to make sure that it’s sustainable. So it’s better to ramp up if you have capacity and then try to turn it down if you realized that you are trying to do this more often than you have the capacity to do so. Heidi Alexander: Well, thank you, Frank, but we do now need to take a quick break. So stay tuned because after the break we will continue talking about best practices and content marketing. Now here’s a word from our sponsors. Advertiser: Not getting enough cases from the Internet or the kind of cases you want, Scorpion can help. Over the last 15 years Scorpion has helped thousands of law firms just like yours to attract new cases and grow their practices. During this time Scorpion has won over 100 awards for their law firm website design and online marketing success. Join the thousands of law firms who partner with Scorpion and start getting more cases today. For more information visit HYPERLINK “http://www.scorpionlegal.com/podcast” scorpionlegal.com/podcast. These days law firms need to do more with less. Making this happen requires efficient, cost-effective tools that work the way you do. Available is a desktop for class solution, Amicus Attorney Practice Management Software improves the organization of your firm and drives your bottom line. Visit HYPERLINK “http://www.amicusattorney.com” amicusattorney.com to discover how you can join thousands of lawyers who rely on Amicus every day to run their practice. Heidi Alexander: Welcome back to the second half of our show with Frank Strong, the founder of Sword and the Script Media. Let’s move on to talk about social media and content marketing. Why is social media essential to content marketing and what are some best practices for using social media to facilitate your content marketing? Frank Strong: Well, I would be cautious about calling it ‘essential’ because I think what is an essential channel varies from organization to organization and will certainly vary from law firm to law firm. It is essential if your clients and perspective clients are there, and a good way to determine that, is to see where your traffic comes from now. For example, is Google Analytics, most organizations will find their top source of traffic is organic and then spots number 2 or 3 will probably be either direct or perhaps a social channel. And then the next piece of that is evaluate you think you can get more traffic and by extension more clients from a particular site, whether that’s Facebook, Twitter, LinkedIn, so on and so forth. So to that end, a couple of best practices are, first, to think about social media as a hub-and-spoke, just like airline travel. Whatever your owned media platform is, that’s your center of gravity and the social channels are just spokes. Next, you don’t need to be on them all, a busy attorney doesn’t have time anyway, so pick one and focus on that. Focus on the one where you think your clients are there. Test that hypothesis, if they are not, move on. Next, share stuff other than yours. Nobody wants to hangout with someone that only talks about themselves, that’s too online, it will put you offline. Third, it’s like networking, just like in a real-world. If you show up one day, expecting the close deals you are going to be surely disappointed. Just like your local Chamber of Commerce. You are not going to walk into one of them and walk out with a new client, but if you go consistently, over time people get to know you, you build trust and the referrals start to come. And then lastly, don’t overlook paid social, it’s similar to PPC, but it’s different. The ways in which it is different is in the targeting, like how you targeted cost-effective. An example would be, if you are a solo or small law firm, a good way to target potential customers and prospects on Facebook would be groups around the Chamber of Commerce, or technology associations. You can also do it by geography and title, and instead of having a strong CTA to come check you out, offer them a piece of advice. Pitch your content, those questions that you answered, that you know they are already asking. Heidi Alexander: Yeah, I have also been hearing a lot about Facebook-sponsored posts boosting your posts, the advertising on Facebook, and how helpful that can be just in terms of narrowing your focus so that you can hit those specific demographics of that potential client that you’d like to hit. Frank Strong: Yeah, well, in particular I think I recommend using like sponsored posts, so write your own content, put that on Facebook and then pay to sponsor it and then use the targeting features to reach audience that you are trying to reach. But certainly you need some of the instant articles or the old notes, they have had a variety degree of kind of a blog platform if you will, but it was back to don’t making home improvements on rental property, right? Put your focus on your own platform and then use those other channels as the spokes to bring clients and perspective clients back to your hub. Heidi Alexander: Yeah, that’s especially a good advice because now LinkedIn has their own publishing platform, so that’s something to be vary of, I hear you saying. Frank Strong: Yeah, it’s the same thing. It doesn’t matter if it’s LinkedIn, Facebook, Google+, Medium, there is a new one, I tell you and — gosh, it must have been 2010, there was a platform called Posters. Posters, is something between a blog post but more than Twitter, so it is in between. I put up 220 blog posts on that platform over the course of two years and then suddenly it shuttered, gone, all 220 post. So it was a very challenging lesson to learn in terms of rental property; I don’t control that platform, they can change the rules, they can disappear, they can be acquired, any number of things can happen. That’s why I think one of the key principles in content marketing is, you have got to own whatever platform it is that you are trying to develop. Heidi Alexander: So based on everything that we have discussed here, clearly content marketing is much more involved than just writing and publishing a few articles. So clearly to be successful, you need some sort of strategy, so what does a good content market strategy look like? Frank Strong: So a couple of things. Number one, it’s documented, with a clear purpose and editorial policy. Just like any other process or procedure in a law firm, from client intake to billing, content marketing needs to be documented. The Content Marketing Institute teams up with another organization called MarketingProfs; they are both very respected within marketing circles. They do an annual survey every year, and year after year they find that best in class marketers are more likely to be successful than their less effective peers if they have a documented strategy. So putting it in writing cannot be overstated. When you start to write things out, you begin to see ways to improve it, better ways to do it. Number two, like I have said over and over, it has got to be on a platform that you own. Number three, it’s focused on iterative improvement, and this is an especially hard one sometimes for attorneys to accept, because they are so focused on perfection, but it’s the old adage that perfect is the enemy of good enough. Sometimes you have just got to keep it going. You can always improve content. I look at things that I wrote three, four, five years ago, and gosh, I would do it completely differently today. But I wouldn’t be where we are today if I hadn’t taken those steps when I did. And then lastly, it’s a marathon, not a sprint. We talked a little bit about time. We talked about compounding returns. Just like your retirement accounts might be compounding returns, just like the relationships you would build in networking events in the real world, like the Chamber of Commerce, content marketing is a marathon, not a sprint. You are not going to show up on day one and have all kinds of results; you have got to build that over time. Heidi Alexander: Well, thank you for that. You are basically doing my work for me. That’s something that I harp on with all of my clients, document, document, document, create processes, very, very important. So looking back at content marketing over the years, it seems like it has changed, so can you talk a little bit about how it has changed and what you see as some of the current trends in content marketing, so what we should be on the look out for? Frank Strong: Yeah, so I think there is three, and I think this is all prefaced by the evolution in the density of information. What do I mean by that? In 2010, the then Google CEO Eric Schmidt said that ever two days we create as much information as we did from the dawn of time up until 2003, that was six years ago. The density of information hasn’t slowed any. So you don’t have to be involved in electronic discovery to know that the volume of information is going to continue to grow, it’s very, very noisy. How do you cut through the clutter? Number one, I think there is going to be a reevaluation of content output. In content marketing circles a lot of times the more and better seems to be diverging trends. I think brands and law firms and anyone in content marketing needs to be focused on creating better, not necessarily creating more. And then secondly, there is a renewed focus on content distribution. There is a number of statistics and surveys in marketing circles going around that 60-70% of the content an organization creates goes unused. That’s because they finish one piece and they are on to the next, and so there needs to be a focus on distribution. How do we leverage what we have already invested in; the money, sweat and equity we have already put into these assets we have developed to get more out of them. So this is a renewed focus on distribution channels, whether that be social media, whether that’s organic search, whether it’s paid models, whether it’s guest postings, contribute articles, but looking at other ways to distribute the existing content that we have. And then finally, the last trend that I see is that there is a move in build versus buy. So we know that building an audience, building a community takes time. The other alternative is to buy one. And a very clear example which got lots of play in the legal community was Microsoft’s acquisition of LinkedIn. A lot of folks see that as a data play or a technology position, what are the implications for CRM and law firm CRM and all of those sorts of things. But really I think other pundits in the community are looking at that as an audience buy. It comes down to about $60 per user on LinkedIn. So Microsoft is buying an audience. There is no reason to say that a law firm can do that. On a grand scale, perhaps it could be one of the large firms buying a publication like Today’s General Counsel or Corporate Counsel from ALM; imagine the ripples that would have in the industry if something like that happened. But I don’t think that excludes small law firms, they can certainly think locally. Here in Atlanta there are a number of business publications, small blogs that have grown up and basically run like a newsroom today, and they have advertising, that’s an opportunity for some of the smaller firms to buy into that market as opposed to trying to build it. And I think that’s a trend we are going to see more and more of in the next probably 12-18 months. Heidi Alexander: All right. Well, thank you Frank, I am sad to report that we have reached the end of another episode of The Legal Toolkit. Thanks Frank for joining me on the show today. If any of our listeners would like to learn more about you and your work, how would they go about doing so? Frank Strong: Certainly. My website is HYPERLINK “http://www.swordandthescript.com” swordandthescript.com. You can find me on Twitter, Frank_Strong and virtually any social media site, either Frank Strong or Frank_Strong. Heidi Alexander: Well, thank you Frank, and thank you listeners for joining me for another episode of The Legal Toolkit. Remember that you can check out all of our shows anytime you like at HYPERLINK “http://www.legaltalknetwork.com” legaltalknetwork.com. Outro: Thanks for listening to Legal Toolkit, produced by the broadcast professionals at Legal Talk Network. Join Heidi and Jared for their next podcast covering the current business trends for law firms. Subscribe to the RSS feed on HYPERLINK “http://www.legaltalknetwork.com” legaltalknetwork.com or in iTunes.